Most refugee situations are not resolved quickly. Instead, they become protracted, stretching over years or even decades, often without a clear end in sight. Of the 65.3 million forcibly displaced people worldwide—some 21 million of whom were refugees as of 2016—more than 40% are in situations that have become protracted (ongoing for five years or more). Because of this, it has become more important than ever to find ways to better integrate refugees into countries of first asylum, particularly by ensuring they have access to livelihoods and economic opportunities. Livelihood programs and interventions have typically been designed and implemented by the United Nations High Commissioner for Refugees (UNHCR), often in collaboration with international humanitarian non-governmental organizations (NGOs). Yet, despite the surging interest and investment – including at the highest political levels – refugee livelihoods is a relatively new field that must work through a number of growing pains and implementation challenges before it can live up to its potential. In recent weeks, the Obama administration has become increasingly vocal about the Syrian refugee crisis sweeping through the Middle East and Europe. Resettling displaced families is costly and complicated—but there are potential economic benefits for US cities willing to do so. On September 10, President Obama said the United States would accept 10,000 displaced Syrians this year. Starting on October 1 as part of an announced increase in the annual refugee admissions cap, the quota will be raised to 85,000 for the 2016 fiscal year. Secretary of State John Kerry says he intends to raise the limit to at least 100,000 in the fiscal year of 2017. During the 2009–11 period, refugee men ages 16 and older were more likely to work than their US-born counterparts: 67% versus 60%. Among the 10 most common origins of recent arrivals, Burmese, Iraqi, and Somali men had employment rates at or below US-born men, while the other seven groups had higher employment rates. Refugee women were as likely to work as US-born women, at 54%. Refugees’ employment rates exceeded those of US-born women in four of the ten most common origin groups (Vietnamese, Liberians, Ukrainians, and Russians), while six sending groups fell below the US-born: Cubans (49%), Iranians (46%), Burmese (42%), Somalis (41%), Bhutanese (36%), and Iraqis (27%). The relatively low employment rates of women from some refugee groups often translate into fewer workers per household and, in turn, lower household incomes. 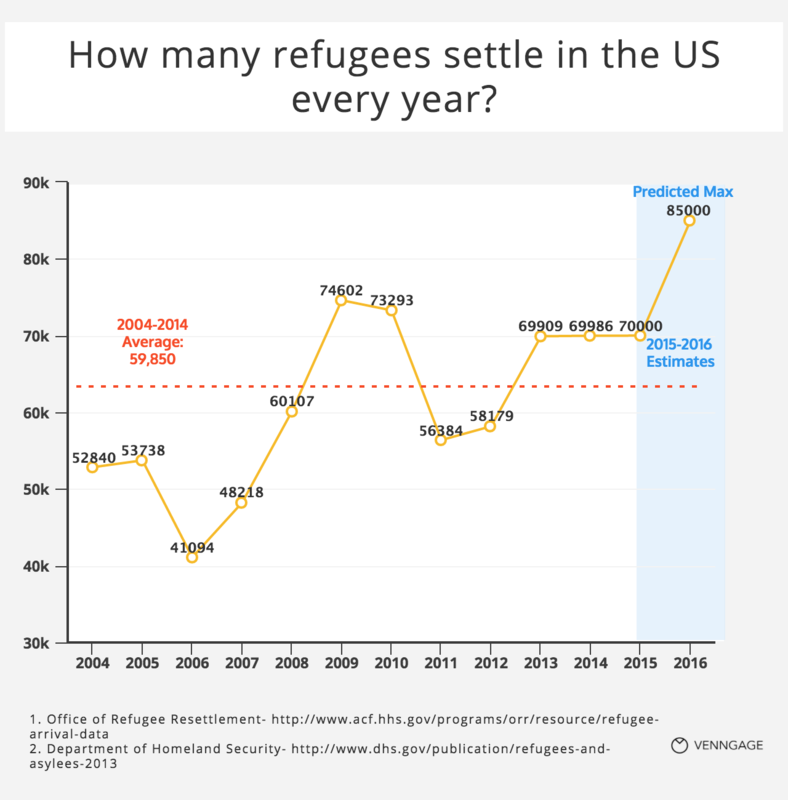 Nonetheless, with their relatively high employment rates overall, refugees in the main are meeting the US refugee program’s goal of promoting refugees’ self-sufficiency. Although the livelihood programs are working towards making people employable and providing sustenance to refugees to get into the regular groove of life, it's important for governments and agencies to define a structured way of handling the next steps of their life, which is employment. Funds availability for livelihood program: While the scale of the program implemented by the US government and its partners is impressive by almost any international standard, it has come under recent criticism for not increasing funding and support for reception and integration sufficiently to address the growing size and needs of resettled populations. The Office of Refugee Resettlement’s total budget increased sharply starting in FY 2013 in response to a rise in unaccompanied children crossing the US-Mexico border. Funding for services to refugee populations, however, has been flat for almost 25 years. Additionally, in June 2014 to serve unaccompanied children ORR diverted $94 million from programs serving formally admitted refugees, although almost $23 million was returned to refugee programs later that summer. Heavy focus on immediate employment: Another concern has been that ORR-funded employment services focus too heavily on immediate employment at the expense of obtaining better job matches, especially for highly educated refugees. Service providers, for example, have expressed frustration that funding does not allow them to prioritize training or skills development programs that might help refugees find higher-skilled and better-paid work in the longer term. Authenticity of refugee status claims: Once a refugee has been referred for resettlement, the US Department of Homeland Security (DHS) determines whether to admit the applicant on the basis of an interview and other evidence. After a decision to admit an applicant is made, the case is referred to a resettlement agency, a non-governmental organization that receives funding from the Department of State (DOS) and the Office of Refugee Resettlement (ORR) within the Department of Health and Human Services (HHS) to resettle refugees in local communities. Although the process is in place for evidence tracking and claim authenticity, there is no method to identify if the claims are right and if the refugee has arrived from the right channels. Government and agencies should start working on digital identity strategy to cover the refugee life cycle in the host land with aspects covering identification, skills, education and vocational training provided over the course of time. The information can be added at each level of the program by the authorized personals which could be used on a longer run for identification, reference and also to provide additional benefits which are part of the resettlement program. With information available on the blockchain at the time of entry and updates over time, agencies can easily track and identify the employability of individuals and also update information which could be accessed by prospective employers for validation, reference and clearance. The same information can be integrated with the social benefit programs in case of employment loss and individuals can leverage social benefits extended by government and agencies. The BanQu network uses a proprietary method to create a mash-up of a ‘selfie’ plus other key human characteristics for people with no access to technology or banking. This Economic Identity then can be augmented by critical pieces of information such as land rights, birth registration, relationship based credit profiles and health records, etc. BanQu aims to gather all meaningful data about the person into a profile that will allow people to step out of poverty. The wide mobile phone adoption in African countries allows BanQu to create a personal digital profile comprised of various records of personal financial and other activities. That profile is recognized and accepted by financial institutions as a legitimate identification information and will allow people to access formal financial services and enable U.S.-based financial institutions to actively participate in the Community Reinvestment Act (CRA) . Bitnation’s blockchain Emergency ID is the first step towards defining a digital ID for refugees in crisis situations. The BE-ID is a rudimentary emergency identification card – based on blockchain technology – that is available to anyone, including individuals who cannot obtain other forms of ID. Issued by no government, refugees apply online and these IDs are issued as soon as the application form is filled out. It works like a mini ‘web-of-trust’ where family members have to verify being each other’s family members through private/ public key cryptography. Proving family relations can make it easier to reunite with your children, parents, or siblings who may be in different locations, displaced in other countries. With more information appended to the ID and government authorization and its inclusion in livelihood programs, The information could be used across rehabilitation programs and used across the lifecycle of crisis.